John D. Scoggin was born in Texas and attended Texas A&M where, as an outfielder, he was an outstanding member of the varsity baseball team. Scoggin was a two-time All-Southwest Conference player in 1941 and 1942, helping lead the team to the 1942 SWC title as the team captain. 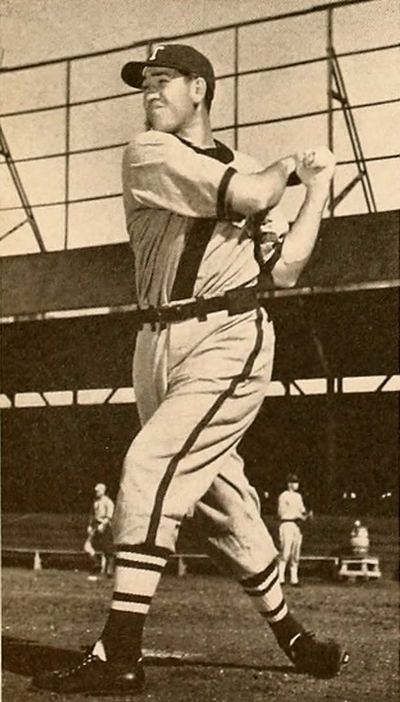 Texas Aggie baseball coach, Lil Dimmit, regarded Scoggin as one of the best collegiate prospects for the majors he had ever seen. But the United States was at war and Scoggin entered military service with the Army Air Force upon graduation. Attaining the rank of First Lieutenant, Scoggin served with the 23rd Bomb Squadron, 5th Bomb Group in the Pacific. On November 16, 1944, First Lieutenant Scoggin was part of Squadron Commander, Major James A. Saalfield’s crew aboard a Consolidated B-24J Liberator that took off from Wama Airfield, Morotai in the Dutch East Indies. Carrying five 1,000-pound bombs, their target was the Japanese fleet in Brunei Bay, Borneo. Attacking against heavy anti-aircraft fire from the Japanese vessels, Major Saalfield’s plane was hit just before the turn onto the bomb run. He peeled off to the right with one engine out and another smoking, before crashing into the South China Sea. All onboard were killed. The remains of the crew were later recovered and now rest at Jefferson Barracks National Cemetery in St. Louis, Missouri. John Scoggin was inducted in the Texas A&M Sports Hall of Fame in 1995.